This is an extended version of the the profile on Cait that I have released as part of my free “Kona Rating Report“. A big “Thank You” to Cait for sharing her story with me! When Cait was getting ready for last year’s race in Hawaii, there were high expectations on her: In 2013 she was the top US female, finishing 6th in 9:10:12 with a sub-3 hour marathon that allowed her to overtake Meredith Kessler in the final mile. She had had a great 2014 season leading into Kona, with a number of podium finishes in 70.3s and a close second place at IM France. Her marathon time in Nice had been a 2:52:26 which was even faster than Mirinda Carfare’s marathon in Roth and the fastest 2014 female marathon before Kona. But in reality, the chances for a good finish in Kona were pretty small when she was on the startline. Only a few people very close to her knew that things started to unravel a few weeks before Kona: Her husband told her in August he needed some space to figure things out and needed to go away for a while, a move that turned out to mark the end of their marriage. Cait said, “It was a really big surprise to me. We tried to start working on things a little bit, but we decided to put everything on hold before Kona. I tried to focus on the race, but emotionally I shut down.” In order to do well in an Ironman, you have to race with all your heart and soul. Cait’s heart and soul were still busy dealing with the separation. She biked almost 20 minutes slower than the year before, and things didn’t get better on the run. Other athletes would have been happy with her 3:16 marathon, for her it was the slowest IM run since 2007 – she finished in 22nd place, more than 45 minutes behind Mirinda Carfrae. After the race it was clear that Cait had lost two important pillars of her strength: The bad result in Kona had her question her athletic ability, and the end of her marriage meant an upheaval in her personal life. Having to deal with only one of these issues can be hard enough, so even with the help of her family she was pretty much in a funk for the rest of the year and early 2015. Things were still raw for her, hard to talk about and process. She was just exercising out of habit and ended up having a three month ‘extended off season’ after Kona. Booking her flights on Friday, she flew out on Monday and spent three weeks getting familiar with the race course. With the limited amount of training it was clear that she wouldn’t be able to tear up the course, she just wanted to “get back the joy that racing can bring”. After the race (finishing 9th) she spent her last day on a Safari before it was time to fly back home. Raceday proved that she was almost back to her old self: After being only 41 seconds back last year, she won the race with a sub-3 marathon! This year she was the one being pushed for the whole run, Lisa Ribes ran a 2:54 marathon and finished just a little over a minute behind Cait. After celebrating her win, Cait took some more time to travel France and Italy with her family. 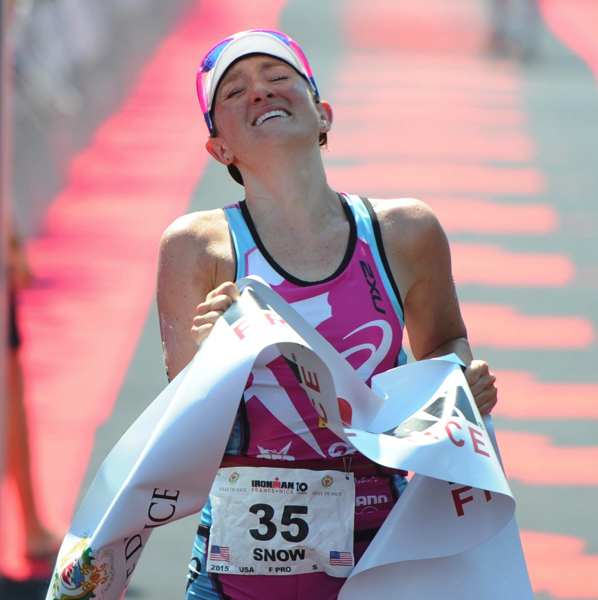 Racing Kona was one of the things furthest from Cait’s mind at the start of the year, but her win in France had put qualifying in her reach after all. She decided to go for the remaining points at IM Whistler, the last race before the July cutoff. Again she took some time to prepare on the course and get familiar with the conditions. Race day turned out to be a big surprise to her and a lot of other athletes: A grey morning that was supposed to be overcast turned to cold and rainy while everyone was swimming, and it continued to rain for most of the morning. Shortly after starting the bike, Cait was so cold and wet that she borrowed a trash bag from an aid station. She ended up riding in that bag in addition to toe covers, gloves and arm warmers for most of the bike ride. Being that cold she wasn’t able to put out decent wattage. By the time she finished the bike her body had used up a lot of energy just to stay warm, and she couldn’t produce a run that would have moved her much closer to the money slots. She finished 10th and was philosophical about not qualifying for Kona – after all she had come a long way since the start of the year. 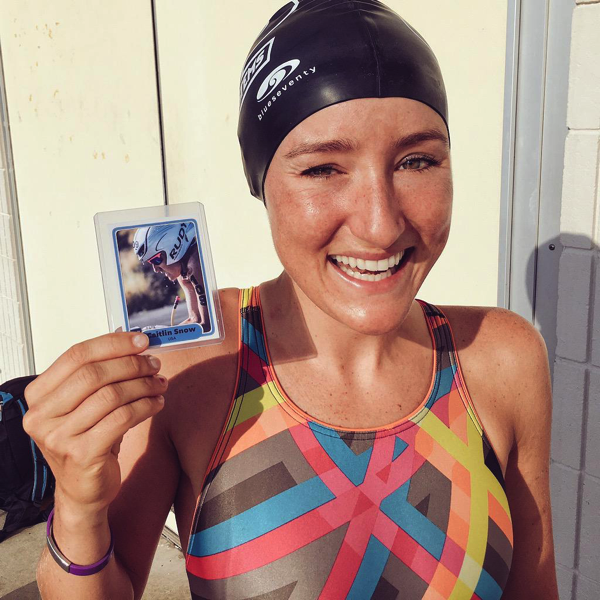 Instead of the extended recovery that Cait would have had to take had she qualified for Kona, she was considering fall Ironman races that would suit her schedule. But when looking at the start lists for August Ironman races, it seemed possible that she could qualify by filling her “open” 70.3 points slot. 70.3 Indonesia seemed like a good choice, it was a new race for Ironman (it used to be organized as “MetaMan Bintan”) and offered good points. Cait put herself on the startlist and jumped on a plane to Indonesia. Coming off the bike she still needed to make up a few spots, but her running speed quickly moved her into second place. When she finished behind Gina Crawford, she had a safe Kona slot after all! Just one year after being a solid Top 10 contender, most people won’t think of Cait when discussing who could be the top US woman this year. She’s probably fine flying under the radar for this year and is doing her standard preparation with an extended stay at the race venue. Anyone who can run sub-3 after a decent bike will be moving through the field. But while she’s competitive enough to want to do well, just being able to race Ironman Hawaii is a big bonus for Cait after the year she has been through.